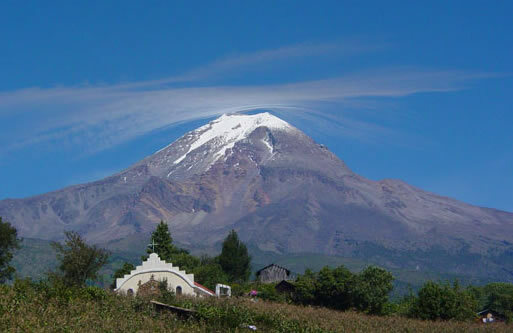 The amazingly diverse state of Veracruz rises from the brilliant blue of the Atlantic to the snow-covered peak of 18,000 ft. Pico de Orizaba (shown above right). 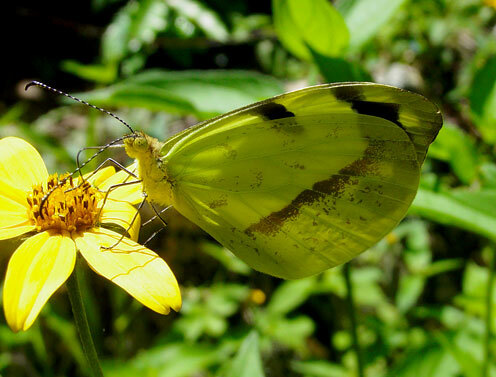 More than 1000 species of butterflies are found in Veracruz. We will sample some of this astounding diversity, butterflying in lush lowland tropical forest, in cloud forest and in spruce forest at 11,000 ft. We have seen more than 440 species on one of these trips! Day 1. Thursday. The tour begins this evening at the Veracruz City airport, in the Mexican state of Veracruz. We will spend this night at a comfortable hotel that was constructed in the 1500s as a monastery. Night in Veracruz City. Day 2. Friday. This morning we will drive toward Orizaba. We will stop along the way to explore some very interesting forest trails that we have found in the general vicinity of Fortin Las Flores. The list of species found that have been found is huge and so we should expect the unexpected. Some years we have found large number of Whitened Bluewings, glistening brilliant blue in the sunshine. One year there was an explosive bloom of Dingy Purplewings and we saw more than a 1000 individuals. Broad-banded Swallowtails both sunbathed for our amusement and puddled so that we could photograph their beautiful undersides. A few puddling spots held 18 species of sulphurs. We'll definitely look for the Small-patched Greenmark (Caria domitianus) we've seen here. The American Museum of Natural History has no specimens of this species and the Mexican National Museum has only 4, all from the Catemaco area. We'll also search for White-spotted Tanmarks (Emesis aurimna), Waiter Daggerwings, Pearly Leafwings (Consul electra), Common Morphos (Morpho helenor), Stormy Satyrs (Cissia similis), Golden-snouted Scallopwings (Staphylus vulgata), among many, many others. The grounds of our comfortable hotel (bring a bathing suit to enjoy its nice swimming pool) can be good for butterflies. Night in Orizaba. Day 3. Saturday. 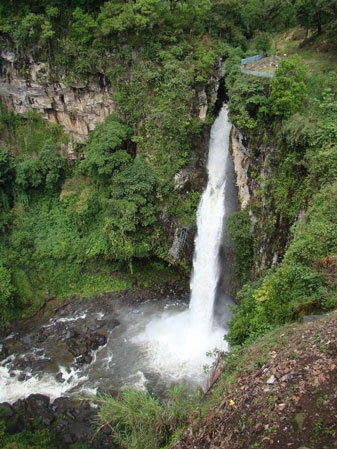 Today we will explore an impressive and extensive canyon in the vicinity of Orizaba. This canyon has yielded one of the most productive and enjoyable butterflying experiences I have had. Along the canyon floor, a system of very wide paths, over level terrain, allows one’s calf muscles to relax while providing easy access to butterfly-filled forest. Abundant flowers seduce butterflies from the trees down to lower levels, resulting in eye-popping close-up views of every intricate detail. Although there’s no guarantee we’ll do as well this year, I've seen more than 150 species in this canyon in a single day. 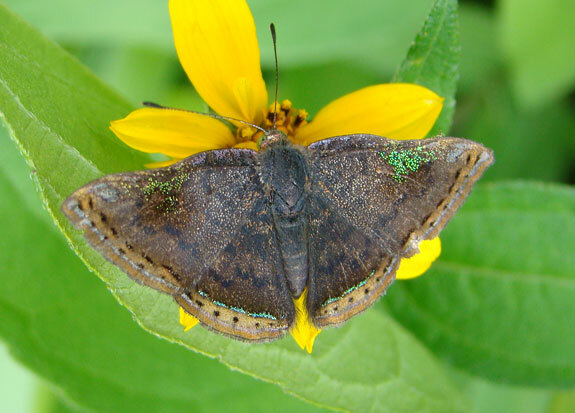 Anna’s Eighty-eights (Diaethria anna) may be common and Navy Eighty-eights (Diaethria astala) (with iridescent navy and turquoise blue above) are possible. Ruby-spotted Swallowtails, Thoas Swallowtails, Tailed Sulphurs, Scarce Yellows (Eurema xantochlora)(this is the only place I have found this species), dartwhites and mimic-whites were some of the swallowtails and pierids seen. 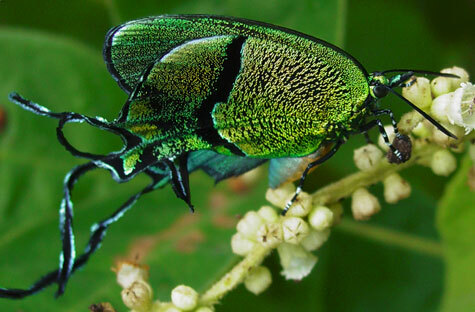 Some of the more sensational brushfoots possible include Orange Cracker (Hamadryas fornax), Splendid Mapwing (Hypanartia godmani) (even more sensational than Orange Mapwing), Waiter Daggerwing, Pearly Leafwing (Consul electra) and Common Morpho (Morpho helenor). Lamplight Actinotes (Altinote ozomene) may show you the way and Tiger-eye Hairstreaks (Rekoa meton) may speed your step. Great Tanmarks (Emesis mandama) are great in size and in the wow factor. 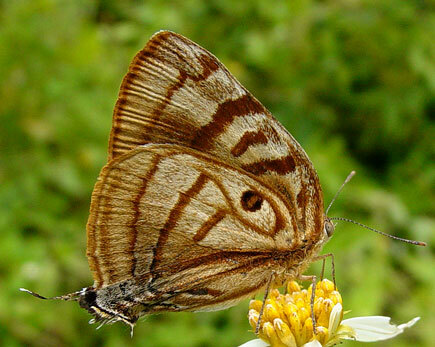 Naturally, many skippers are present, including Two-barred Flashers, Frosted Flashers, Yellow-tipped Flashers and many others. I have found a way to drive our vehicle into the canyon, but for those who cannot help rising before dawn, steps (very, very many steps) lead down into the canyon from our hotel. Thus those of a certain inclination could search for winged vertebrates on the hotel grounds or down into the canyon. Night in Orizaba. Day 4 Sunday. Today we will spend most of the day enjoying the canyon's diverse butterfly bounty but we may also visit a slightly higher elevation oak-pine forest with a different mix of butterflies, including Surprising Whites (Pereute charops) and Magnificent Swallowtail (Papilio garamas). In the afternoon we will drive on to Huatusco, stopping along the way. Night in Huatusco at a comfortable hotel. Day 5. Monday. Today we will visit a coffee plantation that still harbors some of the original forest of the area. Rarely seen White-checked Jewelmarks have been found hilltopping here as have Fiery Sombermarks (Euselasia aurantiaca), Red-lead Fiestamarks (Symmachia probetor), White Satyrs and White-banded Satyrs. We'll all hope to see the small but dramatic Zebra-tipped Geomark. We may or may not see these particular species but we'll almost certainly see many others since more than 150 species have been seen here in a single day! Night in Huatusco. Day 6. Tuesday. This morning we will drive through the mountains to the town of Xico. Here a magnificent waterfall is set into a tropical forest. Least (Euiedes aliphera) and Mexican Heliconians (Heliconius hortense)(whose red-banded HWs and yellow-banded FWs vertically mirror Erato Heliconians) may be flying conspicuously around us while spiffy White-striped Groundstreaks (Calycopis clarina), with a bright and strong white band, and Bromeliad Scrub-Hairstreaks may be more surreptitious. If we're lucky, Trailside Underskippers (Anthoptus epictetus) will be sunning themselves along the trail, showing off their bright orange and black topsides. Night in Xalapa. Day 7. Wednesday. This is your chance to get high on butterflying! We'll head up into pine-oak forest above Xalapa, searching for specialties such as Veracruz Skipperling (Piruna ceracates), Two-rayed Skipperling (Piruna roeveri), and Cloud-forest Pine-Satyr (Paramacera chinanteca). 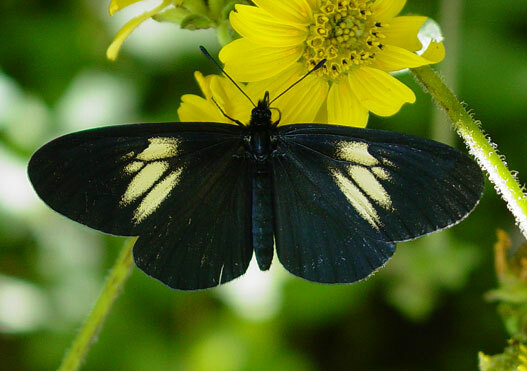 We may also find Mexican Pine-Satyrs (Paramacerra xicaque) and Golden-banded Dartwhites (Catasticta teutila) whose females do indeed have beautiful, broad, golden bands against a jet black ground color. In the afternoon, depending upon our progress, we may go still higher, into spruce forest at 11,000 ft., searching for Guatemalan Hairstreaks (Callophrys guatemalena) and other as yet undiscovered specialties! Night in Xalapa. Day 8. Thursday. This morning we will drive back to the lowlands, toward Veracruz City. 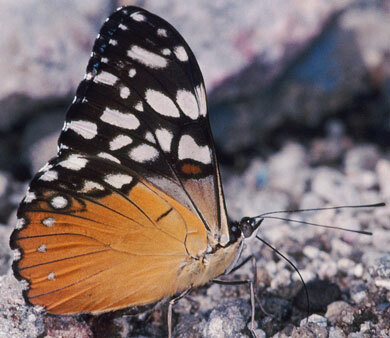 Along the way, we'll stop in some different habitats harboring a wide array of butterfly species. One year we saw more than 180 species on this day. We can't promise we'll do as well this year, but we should see many great species, perhaps including Guatemalan Kite-Swallowtails (Eurytides epidaus), with black and white striped, partially transparent wings; Black-veined and White-tipped Greatstreaks; Common and Green-spotted Brangas; brilliant Carousing Jewelmarks (Anteros carausius), all dressed up for a wild party; somber but fascinating Quilted Metalmarks (Voltinia umbra); and Emerald Agunas (Aguna claxon), with bold iridescent green and a white stripe. Night in Veracruz City. Days 9-12. Friday -Monday. The main portion of the trip ends this morning at the Veracruz airport. For those continuing on the Catamaco extension, this morning we will drive to Catemaco, on the shores of Lake Catemaco. Catemaco will serve as our base for the next four days. Nights in Catemaco. We will visit most, if not all of the following areas. Lake Catemaco An area on the lake has a mix of forest and open fields with flowers in which one consistently finds new butterflies. Pearly Greatstreak (Theritas theocritus), Simple Patches (Chlosyne hippodrome) and Four-spotted Sailors have been common in the past. The crackers in this area are exceptional, with all species of Mexican crackers, except Orange and Yucatan, real possibilities. I have seen five species on one tree! Catemaco to UNAM. A drive toward the coast the University Research Station holds many possibilities, including five species of cattlehearts, Painted Whites (Pieriballi viardi), endemic Pale Daggerwings (Marpesia harmonia), Tiger Leafwings (Consul fabius), Giant Sicklewings (Achlyodes busiris) and attention-grabbing Powder-Blue Skippers (Pythonides amaryllis), a wonderful spreadwing skipper with extensive iridescent blue on its hindwings. Mountains outside of Catemaco. Here, in mountain rain forst, we have been thrilled to see all three species of Mexican morphos, Common Morpho (Morpho helenor), White Morpho (Morpho polyphemus) and Short-tailed Morpho (Morpho theseus). 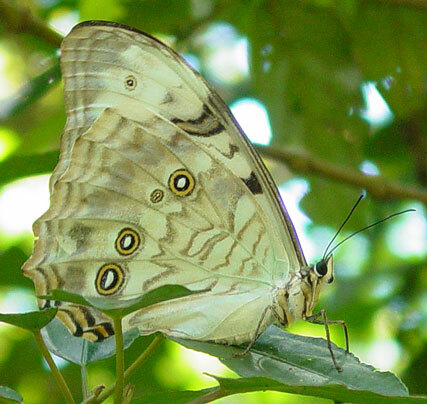 The White Morphos are especially spectactular, sometimes with groups of five or more chasing each other. This is also a good area for Orange-spotted Preponas (Prepona deiphile) and many ticlears and is our best bet for forest species such as amazing Guady Eyemarks (Mesosemia gaudiolum). Cordia flower fields. We have located some areas with Cordia flowers that should be blooming during our visit, although the location of these plant colonies sometimes changes over time. If the plants are there, we have excellent chances of not only seeing a very large assortment of butterflies that are drawn to their nectar, especially hairstreaks and metalmarks, but also getting great views and/or photographs, because the butterflies are mainly at eye level! Species seen in the past, among a very long list, include iridescent green Regal Greatstreaks (Evenus regalis); impossibly long-tailed, shimmering, Wavy-lined Sunstreaks (Arcas cypria); stunning White-spotted Greatstreaks (Atlides carpasia), related to Great Purple Hairstreak but much more in-your-face; tiny, but to boast about Schaus' Streaklets (Ipdecla schausi); street-smart Phat Redheads (Esthemopsis pherephatte); and the always incredible crowd-pleaser, Sword-tailed Beautymark (Rhetus arcius). Day 13. Monday. This morning we will have one last round-up of Catemaco butterflies, then drive back to Veracruz City in the afternoon. Night in Veracruz City. Day 14. Tuesday. The trip ends this morning at the Veracruz airport. Cost of the main portion of the trip is TBD/person from Veracruz City. Cost of the Catemaco extension is TBD. Cost includes double-based accommodations, all meals (except, because of staggered arrival times, dinner the first night), ground transportation, airport transfers, tour leader fees and entrance fees. Not included are alcoholic beverages, laundry services, and other items of a personal nature. Single supplement is TBD for the main portion, TBD for the Catemaco extension. This trip is limited to 8 participants.